in this KSP KSISF KSRP SI Recruitment 2018. 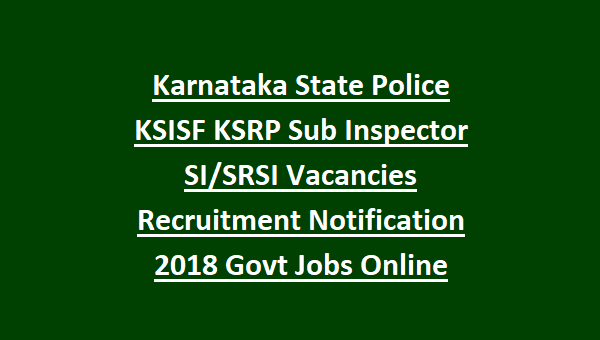 Interested candidates can apply online for this KSP SI Recruitment of KSISF, KSRP Jobs on or before 15-06-2018 through official link of KSP @http://srpsisf18.ksp-online.in. Selection for these KSP SI/SRSI Jobs KSISF/KSRP vacancies will be held through Endurance Test, Physical Standards Test, Written Exam and viva voce. For more details regarding this SI KSISF, SRSI KSRP Jobs age limits, application process online and other details are mentioned below. There are total 45 Sub Inspector Jobs in this latest recruitment of KSP. Candidate must have qualified degree from any recognized university. 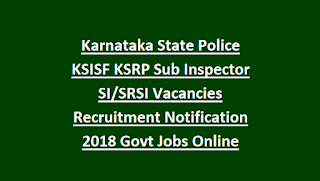 Selection for this KSISF, KSRP Sub Inspector Jobs will be in 3 different stages. Eligible candidates have to submit the application form through online only via the KSP recruitment link of http://srpsisf18.ksp-online.in/. Last date for submission application form online is 28-08-2017.